When I was in Laos last November I attended a wedding of a relative in Ban Keun. This is where my mother’s family is from and we still have many relatives living there. It was a beautiful night for a wedding with good weather, good food, and guests that love to eat, drink, and dance into the night. These days the bride and groom can have a catering service do all the work for a set of menu. Many restaurants also do wedding food service and you can have a choice of your cuisine whether it be Lao, Thai, Chinese, Vietnamese, or whatever your heart desire for the right price of course. 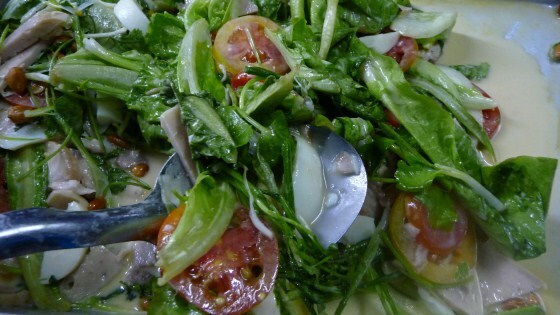 With so many dishes at the wedding, I only ate a bowl of Feu (Pho) and a plate of Yum Salad. Now looking back, I wish I could have tried some laap and few other things.